Twix eggs Easter candy. You get a crunchy cookie with a layer of caramel covered in milk chocolate shaped like an egg. 24 Individually wrapped eggs per box. 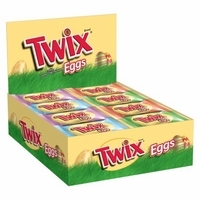 Thesse are a perfect Easter Gift for the twix lover.